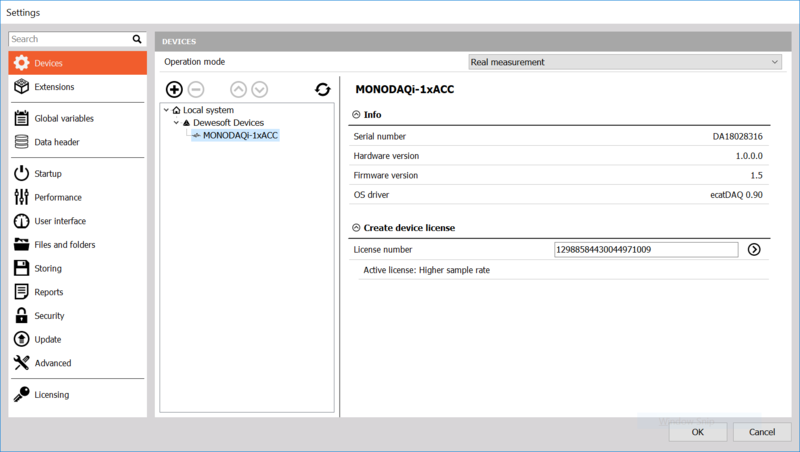 This is a short guide to get you up and running using MonoDAQ-E devices. If you are using the MonoDAQ-U devices, follow this guide instead. To get started, connect the MonoDAQ devices as indicated in the schematic below using the MonoDAQ Power Package. You will need an RJ45 network card port on the PC or a USB-to-Ethernet adapter. Signal and power is transmitted from the power injector to the devices over the same cable. To connect multiple devices, simply daisy-chain them. Keep in mind the IN and OUT labels of the EtherCAT (RJ45) ports: the port closer to the master (PC or controller) is always IN port. *You can run 32-bit software version on a 64-bit processor, but you cannot run a 64-bit version on a 32-bit processor. Unpack and install DEWESoft by running the »DEWESoft_X3_Installer…exe« and following the instructions. 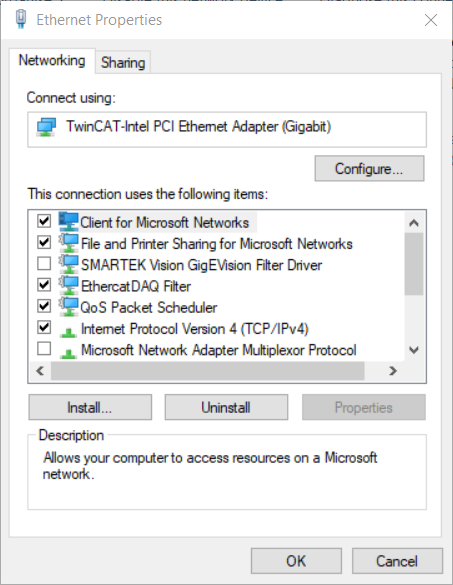 If the devices are not automatically recognized in DEWESoft software (under Options/Settings/Devices screen, see Step 3), this is most probably due to the EtherCAT driver issue. Make sure the driver is installed. It should install automatically with DEWESoft, but in case it did not, the driver installation files are available here. right click on the connection that says “Unidentified Network” and click Properties. You should see the screen below. Restarting DEWESoft should now make the MonoDAQ EtherCAT devices recognizable inside the software. Ensure that EtherCAT devices are properly connected to the PC (see Step 1). After launching DEWESoft X3 software, navigate to the Options/Settings/Devices menu. You should see the connected devices in the list. Figures below show how to access the Options/Settings/Devices screen and a single MonoDAQ-E-ACC device connected in the list. Clicking OK will exit the Settings screen and bring you back to the Channel Setup. Depending on the type of connected MonoDAQ-E devices, the channels from the devices will show up in three different tabs of the DEWESoft Channel Setup. Analog input channels will be shown in the Analog In tab. Digital inputs will be shown in Digital In tab. Output channels (digital or analog) will be shown in Analog/digital Out tab. The tabs are shown in the picture below. If any of the tabs are not shown, you can pull them up by clicking the More… plus button. The tabs will be greyed out if no associated hardware is connected. If analog input devices are connected, the Analog In tab should look like in the pictre below (example with 1 MonoDAQ-E-ACC device shown). Make sure that the Used button is pushed in for the channels you intend to use in the measurement. To configure the analog input settings like measurement type, range, excitation and sensor scaling, click the Setup button on the right end of the channel grid. Invdividual channel setup screen pops up that allows quick and simple setup of the amplifier. The example below shows the MonoDAQ-E-ACC device being configured as an IEPE input for measuring the signal from an IEPE accelerometer. After the channels are configured you can click the Measure button in the top menu to start the measurement. There are several presentation videos on different DEWESoft functionalities available here. 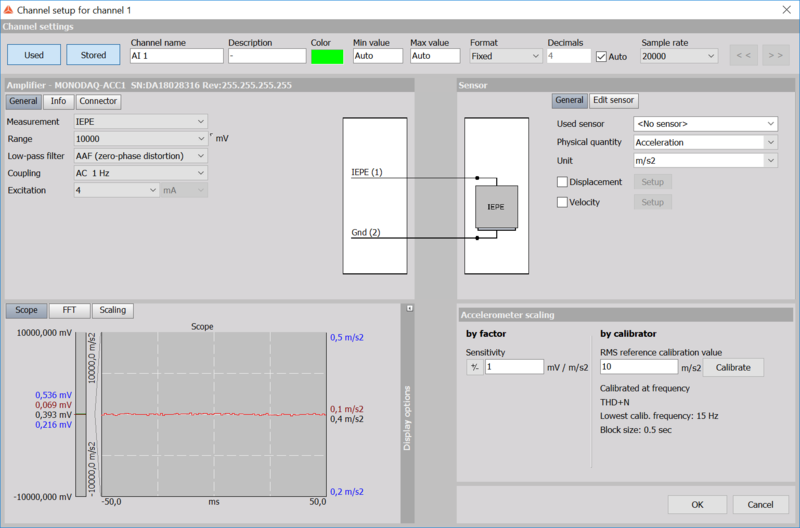 Click here to learn more on how to use MonoDAQ-E series with non-DEWESoft EtherCAT master systems like Beckhoff TwinCAT, NI LabView, Matlab Simulink, Acontis etc.